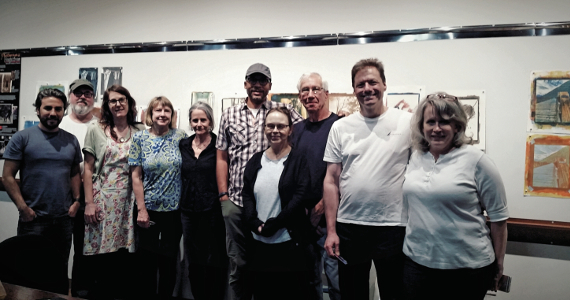 I just returned from teaching a gum workshop at Art Intersection, in Gilbert, Arizona. I had a terrific group of students-- so much fun they were, open to all the possibilities of the gum bichromate process, and they made some beautiful prints in this intense two-day workshop! I'll be adding some images on my 'Workshops' page, so stay tuned. Meanwhile, here we all are, at the end of the weekend, after an intense two days of gum printing! Just one of the many wonderful gum prints made in this workshop. This beautiful image and gum print above is by first-time gum printer, Tom Moore. So see more images made in this workshop, go here.